I feel that this is a great idea. It uses the same psychology that NYC recognized when they asked that chain eateries post how many calories each item contains. People think twice when they see this information. I know that this will be a long and deliberate process to implement, but it starts to get people thinking. Also, here's a link to a great gadget that incorporates Twitter while tracking your energy usage. It would most definitely help. Solar panel systems come with monitors that show real time energy use, a gauge like that in the house would make you more conscious of your consumption. Much like the fuel monitor in a car makes you more conscious of your driving habits. It's a no-brainer! Not convinced – I've seen this all before – basically the government telling you when and how much power you can use – or it's going to cost you big time. Buy into the scheme and before long, you have to watch every watt of power, buy a bunch of expensive gadgets, and get up in the middle of the night to do tasks at 'off peak' times – just to keep your electric bill where it is now. If you don't follow all the 'rules' the electric bill will jump even higher. Exactly the same way the government has turned everyone into a bunch of calorie counting freaks... yet people are fatter than ever. Instead of all this on saving energy...why don't we use some of this brain energy on saving and creating jobs. Why spend billions on a "smart grid," when this information on how much power each appliance uses at any given time is obtainable by EVERYONE for only $20? There's a gizmo called a Kill-A-Watt that comes in a few different models that you just plug into your wall socket, then plug your appliance into it. Shows you watts used, can show you how much it costs per hour to operate things like lamps, computers, space heaters, coffee makers, microwave ovens. Even shows you if your cell phone charger is using electric when plugged-in without a phone being plugged into it. Why not just provide every American household with a $20-$40 tax credit for this? Attach your receipt for it to your tax form, and claim the $20-$40 credit. It's not a Smart Grid we need. It's Smart Legislators and other government officials. Why not use the 4Billion investment, and put it to use on renewable energy or cheaper electricity. Some of it is to late now,,the homes today are much to big,, I raised my family of five in a 1200 sq ft home back in the sixty's with no problem what so ever,, that was typical,, now days three to six thou are norm...a total waste of energy.. I think this is a great idea. If I go to my power company's website everything might as well be in chinese for the break downs of how much power costs when and all that. They are nice to break down our usage on the monthly bill in a graph each month so we can see how much we use in comparison. But with more information we could be saving even more. Wish I could read the utility bills I now get. You cannot understand them, they have so many pages of various taxes you have no idea why they are on the bill in the first place. 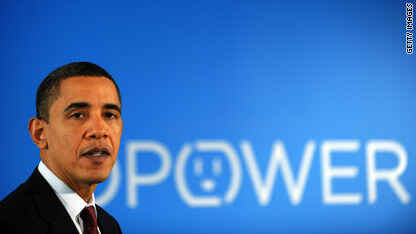 If Obama needs to change this mess, he should take over the Utility companies. I KNOW people use way more energy than they realize. Also stores and corporations could save so much energy by implementing things such as motion detectors that turn off lights in rooms when no motion is detected for say 15 minutes. I am constantly going through my college and turning off lights in huge rooms with no people. Also I drive past huge grocery stores late at night and EVERYTHING is lit. I'm sure the costs of lighting and heating huge *empty* stores night after night are exorbitant. This is absolutely ESSENTIAL to ANY meaningless drive to reduce or control energy consumption. I managed the energy procurement team at a large US airline during deregulation. It was an ABSOLUTE FIASCO. The problems were, and are, too many to name without a Harvard Review being performed, but the root cause always came back to two things; a lack of language and a lack of ability to quantify. You just can't tell someone that product A uses 45kwh and product B uses 50kwh. This is MEANINGLESS. Sure, 50 is more than 45, but what does that mean? How many hours is A used? B? And what does the 5kwh mean to the user? Company? Country? Earth? The ability to quantify demand in real time and see peak and off hours calculated into $$$ is the only way people can understand their impact, and their ability to reduce, and save. It's a brilliant idea. Bringing greater transparency will allow people to understand what they are consuming and to act on it as a result. Provision of accurate information is a cornerstone of an efficient market, as anyone who has taken economics 101 will know. In response to Corey, I'm not sure where you got the idea that the government was telling anyone to do anything. This is just like providing nutritional information on food packaging – it is not a government order, just provision of information. To say the least, it's a bit of a stretch to claim that the government has "turned everyone into a bunch of calorie counting freaks". My electric bill is between 400 to 600 per month. I need a smart circuit breaker box that will tell me what each of the circuits are using so I can then track it back and determine the actual cause of the high electric bill. I don't really need to know or care about the entire grid and what is going on outside my home. I just need to know how to reduce my electric usage. When I have a MPG meter on my car, I drive more efficiently. If I had a power meter on my appliances, I would tweak my behavior similarly. I'd save money on electricity and have a smaller environmental footprint. And that would be a welcome change. I totally agree with M King. I have tried to understand the difference made by my turning off my printer, a/c, laptop, etc. when I'm not using it, but it's like Greek to me. If it was more clearly explained, in terms that a non-engineer could understand, then I'd be more inclined to change. My family uses the electricity equivalent of less than a liter of gasoline per day. "in order for people to save energy, they need to know more about how much energy they're currently using." is what the article says. Heating + driving + energy used to make the stuff that I consume adds up to a whole lot more. The proposed measures are going to show me none of those, and may make me focus on the rather insignificant bits: my electricity usage. I have 2 Kill-A-Watt monitors and rotate then on different power uses. I also have a Smart Meter from my power company that send data to them every day. However I can not see my real time usage with the smart meter. Also the power company can turn off your power remotely with a smart meter. They can also tell what appliances you are using at any time(NILM). This is getting a to BIG BROTHER for me. Nonintrusive Load Monitoring (NILM), or Nonintrusive Appliance Load Monitoring, is a process for analyzing changes in the voltage and current going into a house and deducing what appliances are used in the house as well as their individual energy consumption. Electric meters with NILM technology are used by utility companies to survey the specific uses of electric power in different homes. NILM is considered a low cost alternative to attaching individual monitors on each appliance. It does, however, present privacy concerns. Nonintrusive Load Monitoring (NILM), or Nonintrusive Appliance Load Monitoring, is a process for analyzing changes in the voltage and current going into a house and deducing what appliances are used in the house as well as their individual energy consumption. Electric meters with NILM technology are used by utility companies to survey the specific uses of electric power in different homes. NILM is considered a low cost alternative to attaching individual monitors on each appliance. It does, however, present privacy concerns. its wonderful idea, sure this idea will reduce power consumption. good idea keep it up..
Består av fyra hjul med armar rörliga med vikter på.Som har fyra stödbanor. Vidare har samma axel,med givna positioner varje hjul.Med remskivor på med remar som driver två generatorer. I spent my own $ to buy a device that perform real-time measurement of whole house electrical usage and a kill-a-watt device to measure appliances. I've reduced my electrical usage by 1/5 and my bill by 1/3 by replacing/eliminating the worst offenders and recognizing that I could easily switch to a different usage plan with little change to our usage pattern. I've saved over $2,400 since I did that work at a cost to me of about $300. Good investment. I would save more if my electric company supported real-time reporting of usage. I recently went to the local Home Depot in NY to buy a new electric water heater after my old one started leaking (yes, this is the worst way to heat water and I'm working on upgrading). I was horrified to find that even after the government passed a mandatory energy use labeling law for water heaters more than 20 years ago, the GE brand water heater labels were hidden from view, as the entire heater was inside a cardboard box, with no energy use labels on the outside. Of the 9 different models they carried, only 2 were on display, and no separate energy use info (i.e. brochure or reference chart) was available. When I pointed out to the store staff that this was likely illegal, they had no idea that the energy use labels even existed, and complained when I asked them to open the box so that I could check the labels. Check your local big box store and complain if energy use info is not displayed so that consumers can make an informed choice! That's just BS. Every new electronic device, made, doesn't turn completely off, even when it is "off". It isn't about what the consumer knows......it is about the fact their is too much electronic stuff in use, and most of it is always "on" to some extent. "Why spend billions on a "smart grid," when this information on how much power each appliance uses at any given time is obtainable by EVERYONE for only $20? Why not just provide every American household with a $20-$40 tax credit for this? Attach your receipt for it to your tax form, and claim the $20-$40 credit"
111612000 US households (2009 estimate) * $40 = $4.4 billion. Your suggestion costs billions of dollars as well. This meeting should be held in webinar format, so that folks outside of DC can attend, and or re-play the meeting. Residential customers need real-time information to improve the energy efficiency of their homes. Ditto for health care information – when a doctor orders a prescription, the patient should be told how expensive the medication is, and what other alternatives exist, and which drugs have the fewest side effects. Otherwise, there is no "free market", just a fixed market. We are fooling ourselves if we think by IT enabling the electrical grid we will produce meaningful results. IT technologies only manage and monitor the use of resources, not produce them, and usually at a higher cost to the cosummer. This only benfits the large power producers and marketers in the form of profits, not the consummers. What we really need is for the CLEAN Energy Act of 2007 to be ammended to allow individuals to be fully paid for producing alternative forms of localized, distributed renewal energy. This would propel a huge new industry and create an over abundance of energy. Right now, utilities are the only ones that get paid to produce that kind of energy at 100%. The Energy act protects their ability as monopolies to get full reimbursed by their customers at higher rates to produce renewal energy. We the consummer on the other hand have to pay $40,000 or more to build our own power generation, and thats after rebates. Seems a little unfair since the utilities are government protected monopolies. @Dan Carter: You have a valid point. There are devices that people can get to track their own usage. People should take some personal responsibility when it comes to things like this. However, I believe that the data retained from a "smart grid" would not just benefit the consumers themselves, but also the electric producers and the appliance manufacturers. Imagine if your appliances hooked into the smart grid and actively managaged power usage to save you money. The tech is there we just need the infrastructure to support it. That seems to be our major stumbling block in any of our attempts to create more efficient power sources is the complete lack of infrastructure support for it. I definitely feel that the more information about our energy use, the better. During this past winter my girlfriend's one floor rental unit had a bill for $500 that is normally $250 during the winter. There was no significant change in their heating style so the big increase was a mystery. The best one can do is speculate possible causes. To be able to log into say your google account and monitor your house's energy use in realtime would really helpful. Just like cars with efficiency meter tends to encourage their owners to drive my efficiently, houses with usage meter would encourage people living their to be more efficient as well. The argument about smart grid technology is "too expensive" is silly. That's like saying emission control in automobiles is too expensive. Progress is not going to be handed to us on a golden platter, it's working hard, taking responsibility and making real choices. More big brother in our lives. My girlfriend never turns off the lights when she leaves a room. I cannot seem to break her of this habit. If there is a real time meter or some sort to show her how much money she wastes on lights and other things around the home that consume energy, I think she might just get an engagement ring sooner rather than later. i.e. lower utility bills. I have a SmartMeter and get information on my hourly usage daily. This is through Google's PowerMeter. Except for some issues SDGE is having with sending the info, it is very useful to see your hourly usage. Typical spikes in the morning and evenings. We still haven't figured out what's burning all the power at 2am, but by trial and error, we have reduced our footprint by a great deal. This isn't big brother, it is a better way to see your energy usage. I do home energy reviews for the Energy Trust of Oregon and I think this is a great thing. Every day I go to peoples home and inspect the home for insulation, heating system efficiencies, windows, and hot water heater. I also get a general idea of the construction of the home and try to get an idea how the residents use thier energy. Every one of my customers deeply appriciates my time and energy education I give them. I then install 10 compact florescent bulbs, and shower heads. On average I save 2500 watts in lighting every day per hour of use, and about the same on saved hot water from the water saving showerheads. I let people know what local, state and federal money is available to help them up-grade their furnace, add insulation, more efficient water tank, windows and air-sealing and even solar energy or hot water systems. It is truley amazing the problems I find in the construction of a home that rob people of energy and most customers had no idea that there was a problem. I could go on for a long time here but, to sum it up my customers love what I do for them and I save them a lot of money or help them invest in their energy future. By the way our local energy companies offer this program for no charge. I think this is a good idea. Utilities know how much power costs, and most now keep track of usage in real time. So the info could be made available like remaining cell phone minutes are available through Verizon online. It's really not that complicated, and it is good information to have. I think the push-back will come from the utilities, who generally like to change their rates by the day. This will help to keep them honest. Skip the smart grid. That is simply a ploy to send more work to China. OTH, if this focused on US getting and keeping patents related to our use of it, or at least limited it to those nations with freely traded money, then it is useful. How many of us are ready not to turn on the air conditioner at home on a summer day. Or dry their clothes under the sun instead of using a dryer. We do not have to do it regularly, just symbolic is good enough. The need for energy will reduce only (a) when the production is more or (b) the demand is less. Creating an awareness of how much I use is a great idea but it is a more passive way. So we install a smart grid to "inform the masses on their energy use" and then make the switch to greeny renewables, outlawing all that horrible fossil fuel. All of a sudden it becomes blatantly obvious that there isn't enough power to go around and some brilliant politician decides we need to use the Smart Grid to reduce peoples usage. Perhaps outlaw air-conditioning, those nice big TVs, large refrigerators, or any other big ticket things those horrible rich people use. Because, let’s be honest, your cell phone charger only uses about 20 watts of power, or $1.50 a month. We are going to spend billions of our own dollars to tell the Department of Energy exactly what appliances we use and when. Does no one see this going horribly wrong? I see a way for politicians to draw in huge dollar amounts from appliance lobbyists, buy votes by rationing power to the masses, and appeasing environmental groups by sticking it to the industrial sector(also securing votes). This whole idea is predicated on the idea that people are incompetent and unable to be responsible for themselves. If your electric bill is too high turn off the lights, buy a smaller house, watch less TV, use less air conditioning, or any number of simple common sense things. Are we really so stupid that we need to spend billions of dollars to install a device that tells us to turn out the lights to save a few bucks? I'm not, so stay the H3LL out of my house! Urban Fransson - Simple fact that if this "cheap energy" actually worked we would all have them installed and have no need for the power companies. Now in Swedish ...Enkla faktum att om denna "billig energi" faktiskt arbetade vi alla skulle ha dem installerade och har inga behov av kraftbolag. If you live in the 5 counties of Philadelphia and the surrounding areas, you already have this. It is not future tech, or too expensive, it's already deployed and being used!! Every meter in these counties serviced by PECO (and some areas with water and gas service have the same technology) have meters that transmit data regarding current energy usage that is stored in a database. Those readings are used to render monthly bills. This is actually short of the potential of this sharing of information as right now it is only used to replace the meter readers and give an accurate once a month picture of usage. But it could certainly be adapted to provide more readings and a more complete picture. If information is power, then I suggest we take a serious look at this technology, already deployed, and working for years. Not only for PECO customers, but the system is also deployed in Seattle, Kansas City, and in CT as well, amongst other areas. Hmmm AT&T, Honeywell, J.C., iow the companies who are ready to swoop down and sell you their products that will allow you to live this lifestyle [as soon as its been mandated by Nobama]. States that planned well (TX) have cheap domestic power. There are bigger fish to fry. States that were irresponsible with utilities management (CA) have rolling blackouts. I guess you could say this sounds good if you live in California. Google dontated generously to Obama. Now they are reaping the benefits. Again, Google is leading the way to a healthy future. I am all for this. Not only to save money, but to help combat GW and keep our air clean. I think more needs to be done to address the tragedy of the commons. The fact is, in my apartment building (and most others I've seen), utility costs are simply divided equally among all the residents. Whereas I like to take long, hot showers, I would definately curtail this practice if I knew it brought me savings on my water and energy bill. However, because the savings are divided amonst all 500 or so people in my apartment, I would see only 1/500th of the benefit of my behavior, which doesn't make it enough to be worth my while. Especially when I hear my neighbor continuing to take long showers.. Then I just feel like I'm being taken advantage of, because I'm essentially subsidizing his eco-unfriendly habit. Every month my bill comes with the exact amount of electricity I used. So your boiling water for noodles and you decide to save energy by lowering the heat. But then the water doesn't ever boil. Or you could take your clothes out of the drier while they are still wet. There's no way to significantly cut your power usage without giving up the lifestyle we enjoy. $20-$40 per household? Would cost Billions as well. And ONLY handle one appliance at a time and not be "collectible", etc. etc. etc... Wouldn't give me info on water usage or Gas/Propane usage either. The ideal solution would be a whole house wireless/wired data collector either down to the outlet or to the circuit breaker. Our water/gas meters are currently wireless and read by the tucks as they go slowly down our road to get readings – no reason I can't have read access to my own meter(s)! I do own a Kill-a-watt, and saved over 1100 watts of electricity on my xmas lights alone after plugging that puppy in and replacing everything with LEDs – but I spent that money, not the gov't. I have all my usage info on my monthly bill.Screw google. This data is available to consumers now, with tools like wattvision.com. It's a small device you connect to your electricity meter that collects and uploads data to the internet, viewable online or on your mobile phone. Don't any of you find it interesting that the company who tracks every move you make on the web is now interested in having total knowledge of an infrastructure connecting every one of our lives. Don't fool yourself. Knowledge is power, no pun intended. People could just ask themselves what am I wasting energy on.... instead of adding to the pile of energy losses by tweeting how they "could" save energy. Because lets face it, a majority of Americans couldn't give a rats and the others are just too stupid and fat to notice. Good thought. Knowledge is power. these "smart" products are going to make us go crazy continuously pumping us with information about the latest real time consumption and the price. The best bet is be "smarter" than the product. Use any energy wisely. Use sunlight for lighting, use the best of the day, sleep in the night, pedal your bikes , open your windows for fresh air(if any around u!) instead of air conditioners. unplug your electrical equipments from the power outlets before hiting bed (your entertainment set consumes power even in standby mode). Practice couple of hours every month as if there is "no power". Do not become "powerless" in the absence of power. True, you can use a Kill-A-Watt to gauge what your KWH for an appliance. It will not work on all your electronics because of the obvious one plug input. Using the information from your electric company will give you a better grasp of your energy usage. Its not really that hard to get that information as in the area I live there are alot of Smart Meters being used to gather that information and it helps people lower their energy consumption. I agree customers need to be much more aware about the energy they are currently using, but real-time access to information is costly to implement (compared to a day later on the web) and the value proposition of real time information for customers is questionable. I should know I've participated in a number of in-home display projects and I've been on time-of-use electric rates for more than ten years. The core problem is that real time access gives access to wattage information, NOT historical energy use which is in fact the determinant of the customer bill. Turns out we could play this game for hours and days and learn nothing about what we should do to reduce our energy bill. Watching algebra on the local community college cable channel would probably be more useful. There are those who claim the Prius display that encourages improved driver MPG behavior proves the value of in-home displays. This is a false assumption on two accounts. First, Prius drivers are a captive audience with nowhere else to go while they drive their Prius. Exactly how long do think real people will play with their in-home display above. At home, people have anyplace else to be instead of playing with the in-home display. But the more important reason that the Prius analogy fails is because auto engines are inherently inefficient, and there are real-time techniques that can be learned to improve the MPG of the engine. This is not true of home appliances. They always operate at optimum efficiency; there is nothing a consumer can do to improve real-time operating efficiency of the appliance. This is not to say a customer can not learn how to reduce energy used by an appliance but this requires analysis of historical data about the energy used by the appliance. Minimally, a history of 30 days is required to infer usage by specific appliances from the whole-house meter. No, what is really needed, now, is a standard way for the utilities to provide historical smart meter usage to a third party when requested to do so by the customer. It is innovation on analyzing historical use that will generate actionalble tips for customers to reduce their energy use. Customers don't need real time access to benefit from smart meters. This is a great idea that could start people thinking about and altering the energy use in their daily life. It 's very simple I go online My Electric company does have web page where I can pay my bill and view how much electric I use month by month I also I been watching what I exactly use I actually been saving more energy in the past year then actually using It because I gradually bought those Compact floucent bulbsWhen they were on sale or when I had the extra money. I also do most of my shopping online Plus you buy or purchase products online to help you save on electricity Example Another thing my car got wrecked total loss I went for a more smaller Car and later model vehicle. I get the lowest miles per galon it 's around 24 mpg My highest is around 33 Mpg I also feel it's not the government or corporations wants you to save energy It 's getting to more practical to save energy . We, the people, need to be more efficient in consuming energy. As the world population continues to grow, engery consumption will grow as well. We, the people, need to explore alternatives in energy producing. Power companies should have products (affordable products) so that consumers can keep track of their appliances as well. I would like to know how much my refrigerator, air conditionor, LCD TV, computer, etc.. consumes... but there are no devices that I can buy to do this... I live in Thailand. "Google: People need info to save energy" I am assuming Google is addressing to the people of planet earth and not just the Americans? Even if all Americans are 100% energy efficent, it would make little difference if the rest of the world population is oblivious to energy efficency. Being able to require power companies to suitable real-time, or quasi real-time, information idea. You cannot improve what you cannot measure. I want to know how energy Al Gore is using at any moment. It is interesting to see who teamed up for this idea...these companies seem to see profit in this, especially if they get a mandate by law to do this...then it's a sure buck!!!! You don't need a whole lot of information to do some common-sense basic conservation: Slow down your car. How big of a hurry are you in, do you hate your engine/brakes that much? It's all coming out of your wallet, what are you doing to yourself, there? This is great in theory, but I'd like to point out that any house in America is sucking energy just by itself. That means that even if you unplug and shut off every appliance in your home your still useing energy. What needs to happen is that home owners and apartment complexes need to be given the option of actually genterateing energy to padd the cost of useing it. For instance, a while back CNN here posted up a list of recomentded guides as to how to make your own solar pannels and install them. They are supposed to decrease your energy bill by a significant amount. While I havn't been able to try them due to a mass of issues, that is a far more eligible way to go. We know we have energy problem and we know that we need to use less energy. The problem with that is that almost everything in America runs of energy and we're as bad as any junky for it. All any real company needs to do is make a buisness out of makeing and installing said products where applicable. Note: if soloar isn't possible in your area, I've even seen those yard pinweels modified into minor wind terbines. Conservation is the easiest way to reduce power usages and even better doesn't cost a thing. We were looking at some solar power systems and ran across a website that gave wonderful information of energy conservation. It helped us reduce our electric bills quite a bit. Some of these comments are preposterous! This is exactly why smart meters and a truly smart grid (national) are necessary for us. The more individual users (consumers) know about their electricity spend, the more they can do to change it. Utilities are slow to adopt, at least historically. However, with more and more embracing these technologies – we will get there. @ Martin – You are a bit prejudice, no? You know nothing about me. You don't know I take great pains to recycle as much waste as possible, have a system of timers set up to control lights and turn off 'vampire' appliances when no one is around, have insulated and remodeled my small house – even when there was no tax credits. My wife drives a hybrid car and I have a small economical one. I don't need the government putting another scheme on top of my light bill to force me to 'save' electricity. If it was 'only' about saving power, that would be one thing. But when does the government do that? It's ALWAYS "do as the government says or pay up" – even the government doesn't really care as long as the revenue is coming in. In response to Corey's sentiment – I don't see how the government forcing companies to provide information is the same as government forcing the people to do something. We aren't talking about forcing anyone to change how or when they use more or less energy, just providing data on when that energy is more/less expensive. I don't see the down side to better understanding our energy consumption! I agree with what they are saying, but as a media buyer I have to wonder why the mediums they recommend are Internet and mobile, other than they are seeking a profit from this. Could have done without that bit. I work for Computer Lab Solutions, and we have a program that manages and reports energy usage of computer labs at universities around the world in real time. Seeing these reports, I can tell you so much energy is being wasted – a single university alone often wastes enough energy in a year that’s equivalent to 8 million cars on the road. Why? Because, without the help of some kind of program, configuring 1000+ computers to be energy efficient is next to impossible. So to answer the question asked at the end of the article: yes, I think it will slash the power bill! Our clients saw how much energy they were wasting, and they were able to see where, when and how that energy was being wasted, and definitely did something about it. I think being able to see where energy is being used, or overused, is a major eye-opener. But then again, that was in a university lab environment, where some of our clients were leaving computers on all night or over the weekend because of that whole 1000+ computers to handle issue. But the home is different. My husband and I already try several methods to knock down our power bill, but there are some habits we’re just not going to stop – drying our clothes, boiling water, taking hot showers, etc. But I’d still like to see the stats and know where I can change. Different consumer segments will respond differently to these initiiatives. We would do well to plan our investments based on a better understanding of the behavior of these different consumer segments. For example, Corey brings up a very real (and likely large segment) that I call the "past pioneers". Earlier attempts at conservation, like time-of-use rates, were not implemented in a way that took consumer needs into account. These attempts mostly took utility needs into account (not necessarily a bad thing) so the result is a sizeable, jaded segment of the consumer base. This seems like more government waste. The Smart Grid can be a great tool for both utilities and consumers. However, the first step should always be each of us making our homes more energy efficient. This is always the lowest cost, biggest bang for the buck solution. Before the government starts another program where millions of $$ will be wasted each of us needs to step up and do something at our own homes – the "right thing" shouldn't be government mandated. Interesting conversation. Really liked the tax relief idea for kill-a-watt. Here's an idea, if you are not using it, TURN IT OFF! Now Barry can get back to ruining America. Or people could just go outside and read their meters and then read their bills.